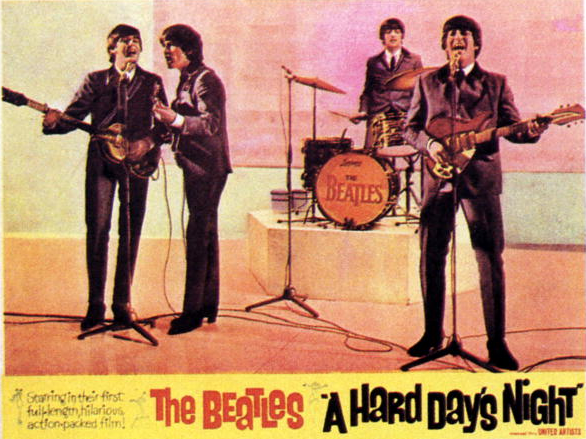 If you've spent any amount of time as a guitarist who loves The Beatles, you know full well that the opening chord of "A Hard Day's Night" is the stuff of legends. There's more myth and mystery about this single chord than all of the King Arthur tales in England. And with good reason: it's practically impossible to dissect it, and even more difficult to reproduce it. That's even less correct, y'all. At least the simpler Chord Songbook caught that there's definitely a 7th in this chord. 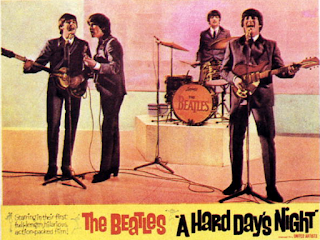 In the past few years, there have been thousands and thousands of words written on the subject (a Google search for "hard days night chord" returns over 300,000 results), and thanks to technology and exposure to The Beatles multi-track/individual track data, most of the heavy lifting has already been done in terms of breaking down the chord into its individual notes. Ignore those fingerings. The bottom two strings are undoubtedly being fretted by George's thumb, not his ring finger. I've left out the piano here for two reasons: first, all of those notes are accounted for in the guitars, and second, we're talking about how to replicate this chord on a solo guitar alone, so unless you plan to drag a grand piano to your next campfire jam session, let's leave it out for now. Now to the all-important question, which is, how do we replicate this chord using just one guitar? 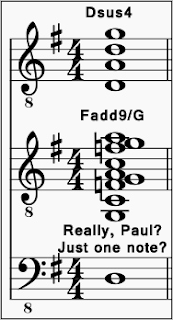 Standard guitar tuning doesn't even let us get all the way down to Paul's D note. Which is why we're not going to use standard tuning. We're going to tune the low E down to a D, and tune the low A down to a G. Think of this as an Open G tuning that can't quite commit. Those two re-tuned strings give us the low D and G notes, so now we just need to fill in the F, A, C, and high G -- which is precisely what an Fadd9 chord is. 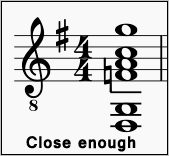 Yes, I realize this is missing the high A and the D just below it, but this is still far and away a more accurate sounding chord than a Gsus4 or a G7sus4, far closer to the "real thing" than can be achieved with standard tuning. If you have a 12-string, you'll get those high A and D notes built in anyway. Finally, what do we do with the rest of the song now that we're in an alternate tuning? The song uses Bm, Am, Em, F, C, and D chords in addition to the "home G," so we need a way to voice those chords if we're going to do more than just strum the opening chord and move on to something else. I did notice that your chord chart for Em is not quite correct: the fourth string shouldn't be open, it should have a second fret E.
Listen to Beatles-a-Rama while you browse! That nasty diminished chord in "You Won't See Me"
The Beatles and the "Jimi Hendrix chord"
The Beatlesque hooks in "My Brave Face"
Tune down for what: "Rain"
Tune down for what: "I Will"
Capo vs no capo in "I've Just Seen a Face"
The constant D in "Put it There"
The forgotten chord in "I Need You"
The movable C7 and "Honey Pie"
Adding the bass-and-bounce to "Penny Lane"
Borrowing ukulele chords for "Isn't It A Pity?" You'll need this tuning for "Too Many People"